In our view a few colorful edible flowers brings a new dimention to mixed goumet salads. 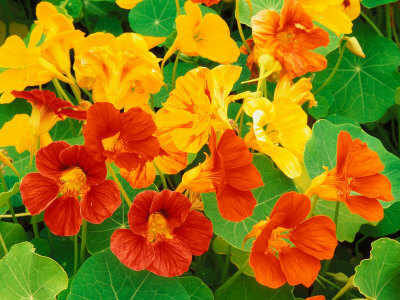 Simple to grow this nasturtium vatirety can be trained up a trelis or left to trail along the ground as decorative edible ground cover. In shades of orange yellow, golds and red this really is a great tasting flower, a feast for the eyes as well as the tastebuds.